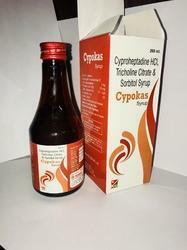 Providing you the best range of cyproheptadine syrup with effective & timely delivery. Each 5 ml contains: Cyproheptadine Hydrochloride 2mg+Tricholine Citrate (65%) 275 mg+Sorbitol Solution (70%) 3gm. Looking for Antihistamine Medicine ?